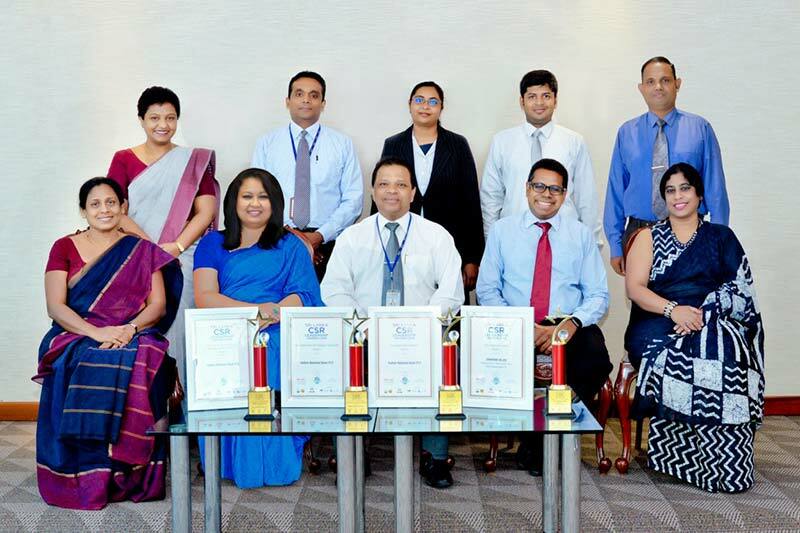 Sri Lanka’s premier private sector commercial bank, HNB PLC, reinforced its role at the forefront of the country’s corporate sector, sweeping the Sri Lanka CSR Leadership Awards with four accolades including the award for Best Use of CSR Practices in Banking and Finance. Endorsed by the World CSR Congress and CMO Asia, the Sri Lanka CSR Leadership awards stands among the most prestigious platforms for the recognition of corporate efforts to positively impact the environment, individuals, communities and countries they operate in. Leading from the front, HNB Managing Director/CEO, Jonathan Alles was recognized for his innovative and empowering approach to corporate social responsibility which had been implemented across the bank, winning the individual CSR Leadership Award. Additionally, as an organization, HNB also won the awards for Best Workplace Practices and Best Corporate & Financial Reporting in addition to winning its topping the banking industry in 2018 with its groundbreaking CSR practices. We are deeply honoured to have been selected as winners of the CSR Leadership Award, and are delighted with HNB’s outstanding performance at this year’s awards. These accolades are a result of continuous efforts that we have channeled into transforming HNB’s role – not just for the Sri Lankan economy, but in society and the environment as well. Among the bank’s key initiatives is the continuing success of its microfinance programmes, which combined with its comprehensive island-wide presence has facilitated wealth creation, access to markets and finance while reducing inequalities and promoting rural entrepreneurship and enterprise. The bank has also played a pivotal role in funding innovative sustainable energy projects – including Sri Lanka’s first Waste-to-energy plant, in addition to arranging funding for the island’s largest solar power plant. Similarly, HNB has also invested extensively towards the establishment of roof-top solar power capacity across its entire branch network with a view to reducing its own carbon footprint. Meanwhile, the HNB Sustainability Foundation – first established in 2009 – continues to function as an independent body primarily focused on community development initiatives around education, heath, environmental conservation and sustainability and the empowerment of entrepreneurs. HNB’s benchmark-setting performance at this year’s Sri Lanka CSR Leadership Awards represents the most recent in a long and growing series of local and international accolades secured by the bank over the recent past, including clinching the award for Best Integrated Annual Report at the CMA Integrated Reporting Awards, Runner Up Award for Best Corporate Citizen by the Ceylon Chamber of Commerce. The bank was also awarded the Overall Runner Up at the ACCA Sri Lanka Sustainability Reporting Awards and Winner Banking Category. Similarly, the bank also won a slew of international awards including Best CSR Bank in Sri Lanka and Best SME Bank in Sri Lanka by Asiamoney, in addition to being awarded Best Retail Bank by the Asian Banker and winning Bank of the Year and being ranked highest among Sri Lankan banks in the Top 1,000 Banks in the World by The Banker Magazine UK. Operating across 252 branches island-wide HNB also stands as the most profitable private banking group in the country, maintaining a strong and growing presence across retail, corporate and Micro and SME sectors, extending cutting edge banking and financial services to a wide range of clients.